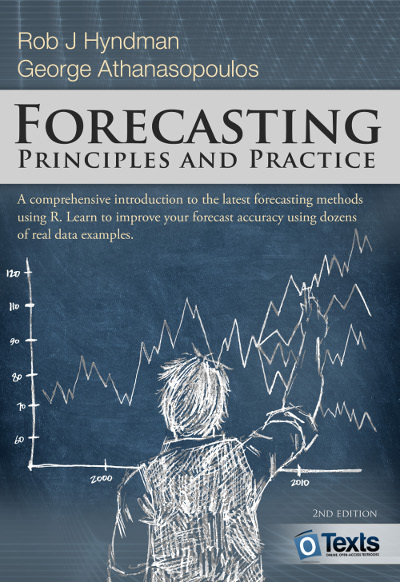 A comprehensive introduction to the latest forecasting methods. Examples use R with many data sets taken from the authors’ own consulting experience. In this second edition, all chapters have been updated to cover the latest research, and three new chapters have been added on dynamic regression forecasting, hierarchical forecasting and practical forecasting issues. OTexts is an online textbook publisher. Our books are freely available to students everywhere, whether for self-learning or as part of a university courses. For now, we are only hosting books written by Professor Rob J Hyndman and coauthors. © OTexts, Melbourne, Australia, 2018.